Welcome to The A.V. Club’s Daredevil binge-watch. From Friday, March 18 through Sunday, March 20, A.V. Club contributor Caroline will be watching and reviewing every episode of Netflix’s returning superhero series. Though she’s working straight through the season, she’ll be taking some breaks, too, posting five reviews on Friday, four reviews on Saturday, and four reviews on Sunday. You can follow along and comment on the whole season on the binge-watching hub page or chime in on individual episode reviews. For those watching the show at a more moderate pace, reviews by Oliver Sava will run daily starting Tuesday, March 22. “New York’s Finest” is a beautiful looking episode of Daredevil. Director Marc Jobst has an eye for adding visual interest to even fairly static scenes—like this lovely composition in which the Punisher climbs up on a billboard while continuing his conversation with an imprisoned Daredevil below. Jobst films Metro General in long takes that emphasize the nonstop pace of the hospital and the Byzantine maze of patients that fill the ER’s hallways. I was impressed with his style even before we got to the five-and-a-half-minute final fight that plays out as if it were all filmed in one take. Those unique visuals are crucial because elsewhere this episode is lacking in originality. The centerpiece is an extended rooftop conversation between the Punisher and Daredevil in which they discuss the morality of vigilantism and murder. The whole thing works better than it should—mostly because Jon Bernthal and Charlie Cox bring a lot of nuance to their performances—but it’s an overly familiar conversation I’ve seen in dozens of superhero properties before. Part of the problem is that I’ve never really been interested in the question of whether or not a superhero will kill (in his excellent pre-air review, Dennis Perkins seems to have enjoyed this storyline more than I did). Comic book worlds are just too heightened for me to feel invested in that kind of moral quandary. Daredevil is an utterly brutal fighter and the idea that he has enough precision to bash someone’s head in while being completely confident he didn’t kill them is absurd. He shoots someone in the leg in an abandoned warehouse tonight—is he positive that guy won’t bleed to death? Obviously assassinating someone point blank is different than beating them up in self-defense, but I just don’t find this killing vs. not killing debate to be that engaging. That said, I’d be more likely to forgive a return to familiar territory if the episode’s optimistic hero vs. cynical antihero dialogue didn’t feel so rote. The Punisher/Daredevil tête-à-tête works best when it brings something original and specific to the discussion, like the way Matt eagerly asks Punisher whether he still attends mass or the tense moment in which Punisher charms a nosey old man while secretly aiming a gun at his head. The fact that Matt’s no-killing policy stems equally from his Catholic faith (he believes in redemption) and his profession (he believes in the law) adds a new twist to the usual moral debate, but this episode is too busy repeating platitudes to mine the specificity of Matt’s worldview. But, hey, Claire Temple is back and that’s awesome! It’s incredible how much energy and personality Rosario Dawson brings to the role even when she’s basically just there to chat with Foggy and search a hospital computer system. I found the scene in which Foggy talks two warring gang members out of fighting to be slightly patronizing (this season is really interested in presenting Foggy as an infallible legal superhero, huh? ), but it’s nice to see Matt’s two friends bond over their mutual concern for him. On Wednesdays, we wear blue. All that being said, I imagine most of the discussion about this episode will center on that virtuosic final showdown. The single-take hallway fight was one of the most talked about aspect of the first season, and this episode tricks you into thinking it’s merely repeating that staging before expanding the battle into a stairwell and through the rest of the building. But while there’s no doubt this supped up fight is impressive on a technical level, it’s unfortunately missing the stakes that made that original so compelling. In the first season fight, Matt was beating up baddies in order to rescue the kidnapped little boy at the end of that infamous hallway. Here he’s mostly just beating up the Dogs of Hell because it looks cool. I like that Matt initially tries to flee but feels compelled to jump into action to protect the old man from the earlier scene. But at some point the whole thing just devolves into a senseless bloodbath. And in an episode all about when and how vigilantes should use violence, that’s kind of a problem. Standout moment: That scene in which the Punisher (a.k.a. Frank Castle) talks to the old veteran is truly fantastic. 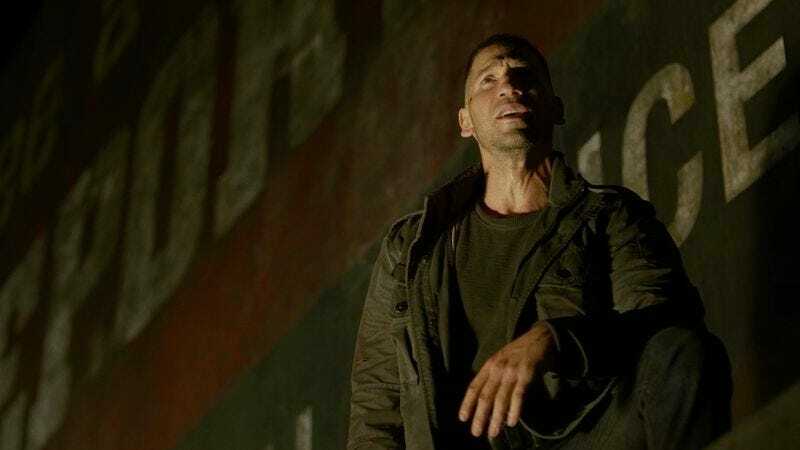 I love how easily Bernthal turns on the charm and how fully the old man is won over, all while that hidden gun ratchets up tension for the audience. Marvel Cinematic Universe connections: Claire mentions the time she helped a big strong guy who was trying to do good—which you can watch for yourself in the Jessica Jones season finale!